Add a hint of your interior theme to your front door with this Esschert Design Brown Cast Iron Scroll Doorbell. The timeless shape, traditional color scheme, and hardy construction create a classic piece, while its functioning bell notifies you of any guests at your door. An 8" tall, cast iron bracket attaches to your wall in moments, supporting the lovely, arched arm and bell. One vivid scroll sits beneath this arch, and additional curls on the body of the item further the motif. A 4.25" diameter bell rests at the end of the hanger, and its cast iron clapper with rope pull creates a resonating and clear tone. Black hues on both the bell and hanger add a distressed look, and the white rope pull offers a bit of contrast. The back plate attaches to a wall using screws (not included), and the cast iron construction ensures a durable item. 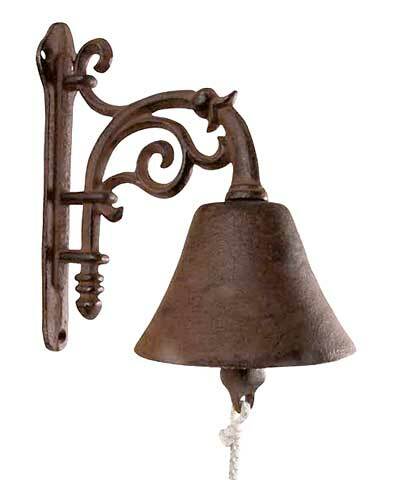 Welcome guests to your home in a timeless way with this Brown Cast Iron Scroll Doorbell. Some assembly required.